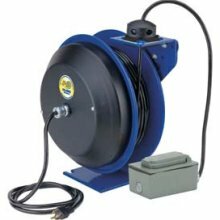 Coxreels EZ-PC Series spring driven “Safety Series Power Cord” reels are heavy duty, industrial grade power sources. They replace tangled extension cords and self-retract to increase safety, productivity and efficiency. The EZ-PC Series are designed for long-lasting, trouble-free performance even under the most demanding conditions. All models feature Coxreels’ patented EZ-Coil controlled retraction. EZ-Coil retracts up to 80% slower than conventional spring driven reels to promote operator safety and reel longevity. All Coxreels are built to order, please allow 2-3 weeks for delivery. EZ-PC SERIES OFFERS: Includes 5’ Pigtail and Grounding Plug Heavy Gauge Powder Coated Steel Components Cover “Super Hub” Dual Axle Support On Models With Size Index #3 & #4 Reduced Retraction By Up To 80% SPRING DRIVEN FEATURES: Auto Rewind Easily Wraps, Stores ..
All Coxreels are built to order, please allow 2-3 weeks for delivery. EZ-PC SERIES OFFERS: Includes 5’ Pigtail and Grounding Plug Heavy Gauge Powder Coated Steel Components Cover “Super Hub” Dual Axle Support On Models With Size Index #3 & #4 Reduced Retraction By Up To 80% SPRING DRIVEN FEATURES: Auto Rewind Easily Wraps, Stores and Protec..
All Coxreels are built to order, please allow 2-3 weeks for delivery. ***This Item Comes Without a Hose, Without a Cord, and Without an Accessory*** EZ-PC SERIES OFFERS: Includes 5’ Pigtail and Grounding Plug Heavy Gauge Powder Coated Steel Components Cover “Super Hub” Dual Axle Support On Models With Size Index #3 & #4 Reduced Retraction By Up To 80%..